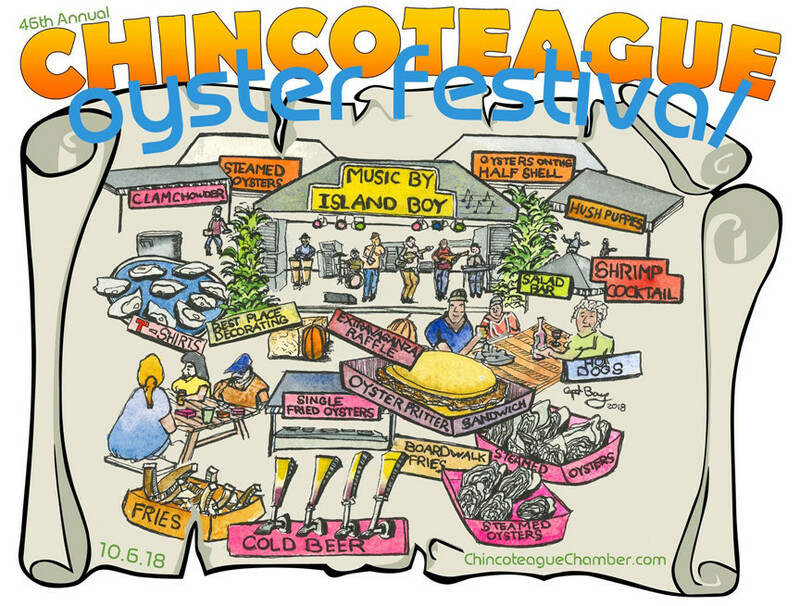 Chincoteague Oyster Festival 2018 - It's Okay To Be Shellfish! « Chincoteague Chili Chowder Cook Off, Plein Air Art Show, & More! Luckily, here on Chincoteague Island, you don’t have to be content with your memory or imagination. Fresh seafood is always on the menu and that includes oysters. Chincoteague is known for its oysters. Our waters are responsible for producing “Chincoteague Salts” – a widely sought after variety. Oysters played a big role in the history of Chincoteague. So much so that, even today, we celebrate them and the bounty of our waters every year. Chincoteague Oyster Festival 2018 continues that tradition with an all-you-can-eat extravaganza. Come out to Tom’s Cove Park this October 6th for oysters served raw, steamed, single fried, and frittered. There will also be clam fritters, clam chowder, shrimp cocktail, and hush puppies. Want to come but not a big seafood fan (how’s that again)? No worries! There will also be non-seafood fare like hot dogs, boardwalk fries, and a salad bar. Your Chincoteague Oyster Festival ticket entitles you to all you can eat, including non-alcoholic beverages (beer will be available for sale). Chincoteague Oyster Festival also includes live entertainment, souvenirs, raffles, awards, and more. Chincoteague Oyster Festival tickets to this event go fast, so don’t hesitate! Visit the Chincoteague Oyster Festival website for tickets, directions, and other information. Miss Molly’s Inn is the perfect compliment to any Chincoteague Island getaway. Located on Chincoteague’s historic Main Street, we’re minutes from shops, restaurants, and more, including the famous wild ponies of Assateague Island. Book your stay at Miss Molly’s Inn today!